mCash allows you to experience a whole new method of carrying out financial transactions by maintaining a Mobile Money Account. This is both convenient and easy to use. You will be able to deposit, withdraw, transfer funds as well as purchase goods and services and even pay your utility bills . Who can use the mCash service? All Pre Paid and Post Paid customers of Mobitel. 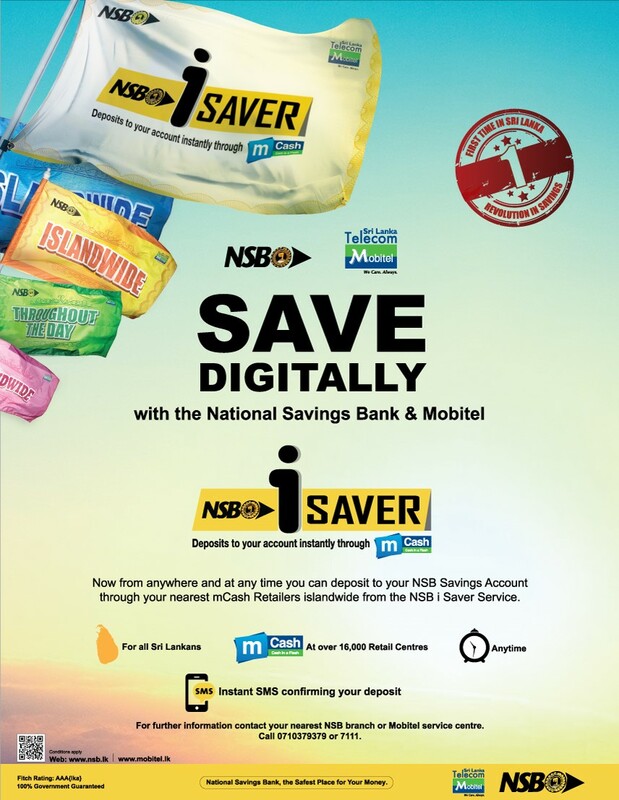 What is meant by save 15% on Payments Offer? 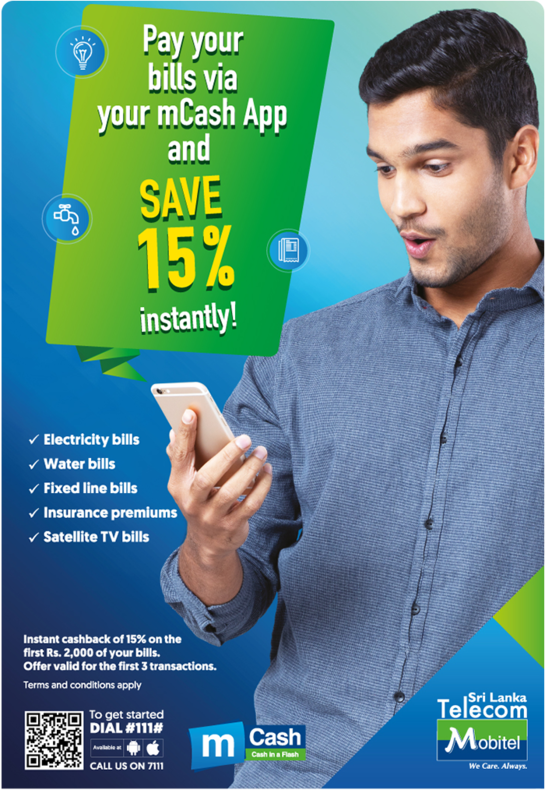 This is a special offer where customers can save 15% on the first Rs 2000 of Utility and Insurance payment using mCash App only with an Instant Cashback. Is this a Cashback Offer? How does the Cashback offer work? Customers making Utility and Insurance Payments via mCash App will get an instant Cashback of 15% on the first 2,000 payment. This offer is only valid for 3 transactions in a given month with a maximum Cashback amount of Rs 300 per transaction. 1st Transaction (Ceylon Electricity Board Bill) – Rs 2000, Customer will get an instant cashback of Rs 300. 4th Transaction (Water Bill) – Rs 1500, Customer will not get a cashback because at any given month the Customer will only be eligible for a cashback for a maximum of 3 transactions. Is the Cashback available for 3 Utility Payments & 3 Insurance Payments in a month? No, collectively only 3 transactions will get a 15% Cashback. It could be 3 Utility Transactions, 3 Insurance Premiums or a mix of both Utility & Insurance payments. What are the transactions eligible for the Cashback offer? Are Mobile Bills & Reloads eligible for this Cashback offer? Is it a must to make Transactions via the mCash App to get the Cashback? Yes, only transactions done via the mCash App will get the Cashback offer. 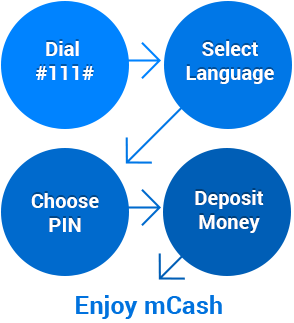 What happens if a payment is done via USSD? The payment will be processed normally but there will not be a Cashback. What should be done before doing a transaction? How to register for mCash? 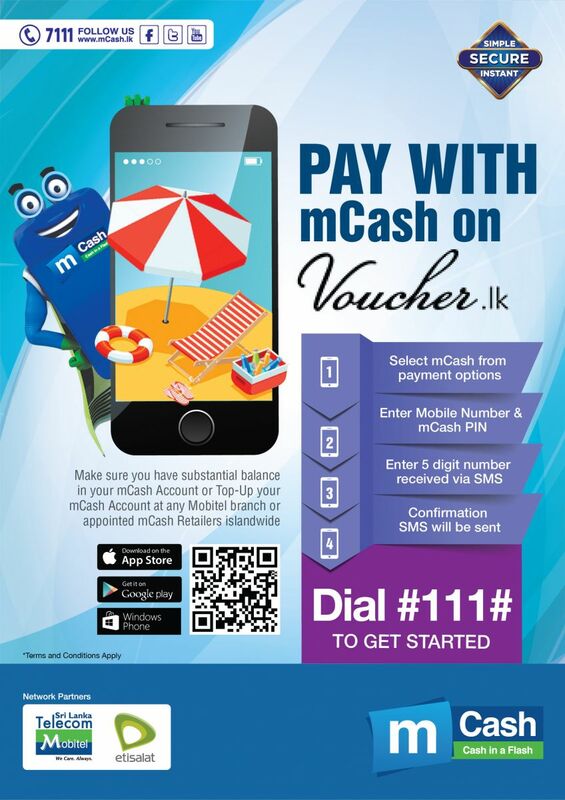 Dial #111# and follow the steps to register for mCash free of charge. How to Top Up mCash? Using the mobile or internet banking facility of Commercial Bank, Hatton National Bank, Sampath Bank, Pan Asia Bank or Cargills Bank Account. How to make a payment using mCash? What are addional charges for making payments via mCash? What could be done from the Cashback amount? What should be done if the Cashback amount is not received? 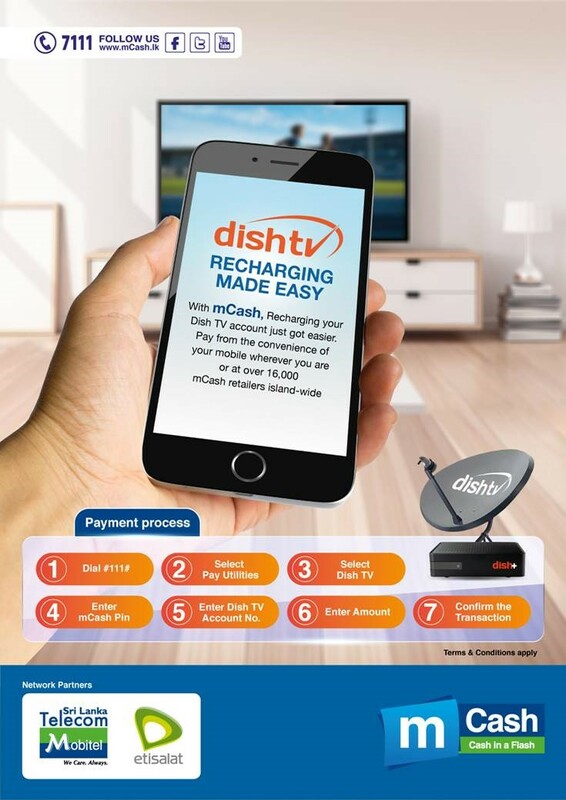 For a Basic mCash Account only Rs 10,000 worth of mCash Top Ups are allowed within the day and for an Enhanced mCash Account only Rs 25,000 worth of mCash Top Ups are allowed within the day. If this limit is reached the Cashback value will be received the following day. What is the promotion duration? The Promotion will be available from 25th of the month to end of the month for a limited time. The cash back offer is valid on the every first Rs. 2,000 of total transaction and valid for up to three maximum transactions per month. This promotion is not applicable for Mobile Payments and Top Ups. Cashback will only be eligible for transactions made via the mCash App. 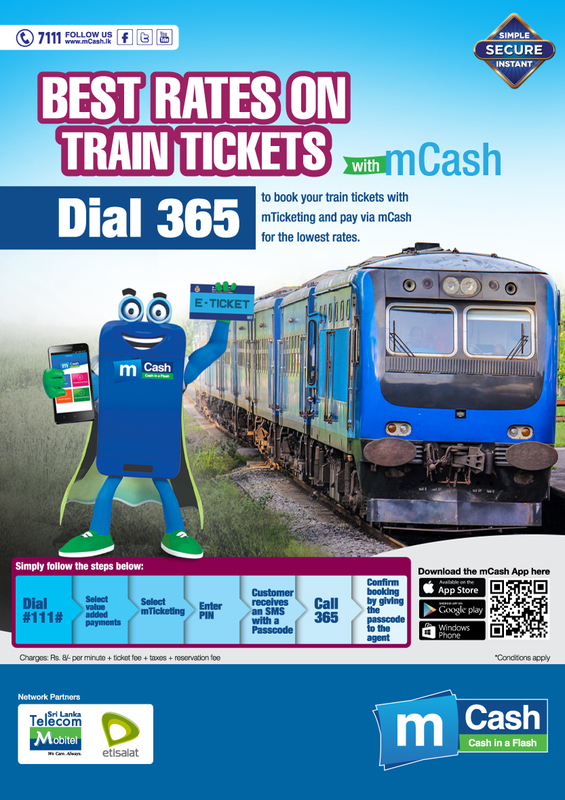 Customers are expected to use the promotion in good faith and if Mobitel (Pvt) Ltd identifies that a Customer is misusing the mCash promotion or if he/she is not adhering according to Fair User Policy, then the customer shall be suspended from enjoying the service as deemed necessary by Mobitel. Mobitel (Pvt) Ltd deserves the right to conclude the cash back offer at any point of time. 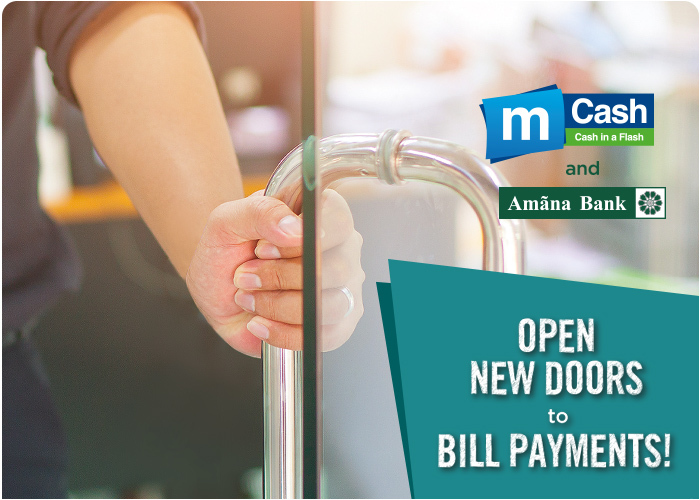 local government bills, and Takeful insurance premiums and top-up their mCash accounts at any Amana Bank branch around the island. Who are eligible to take part in the promotion? What requires to be done to take part in the promotion? What is the duration of this Promotion? How can I get registered to mCash? Dial #111# and follow the instructions. The account would be a Basic account with a maximum transaction limit of Rs10,000. In order to increase the transaction limit to Rs.25,000 (to create an Enhanced account), you should visit a Mobitel Branch. There are no extra charges for mCash registration. How can I pay my Insurance Bill? 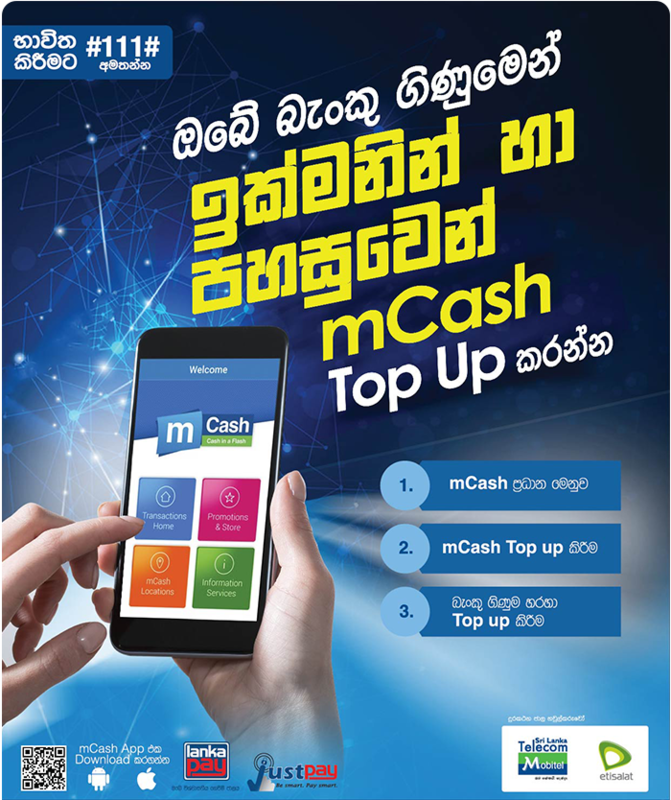 How to Top-up your mCash Account? You could ask a friend and family member to P2P Transfer to you. 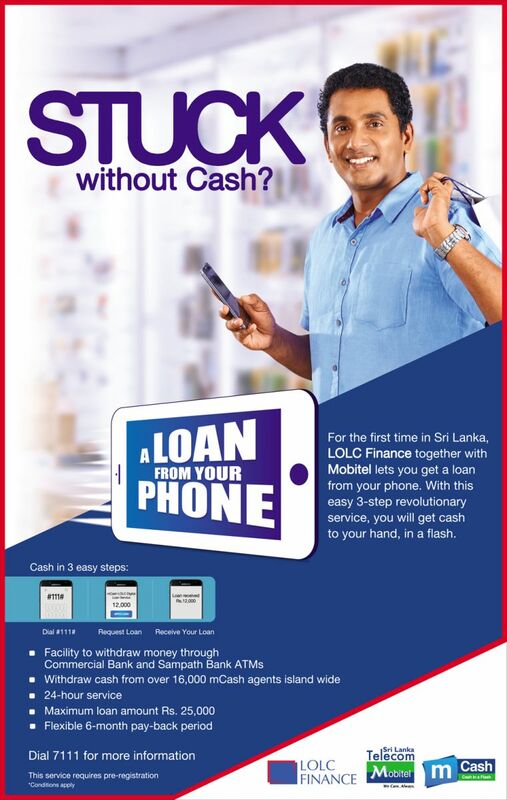 Mobitel, the National Mobile Service Provider, has partnered with Lanka Clear Brain child, JustPay©, a secure, real-time payment service, to enable Mobitel mCash customers to top up their wallet directly from their preferred Bank Account for the first time in Sri Lanka. What is the benefit mCash customer receive from this new Service? mCash customers can Top Up their wallets from their preferred bank account real time. 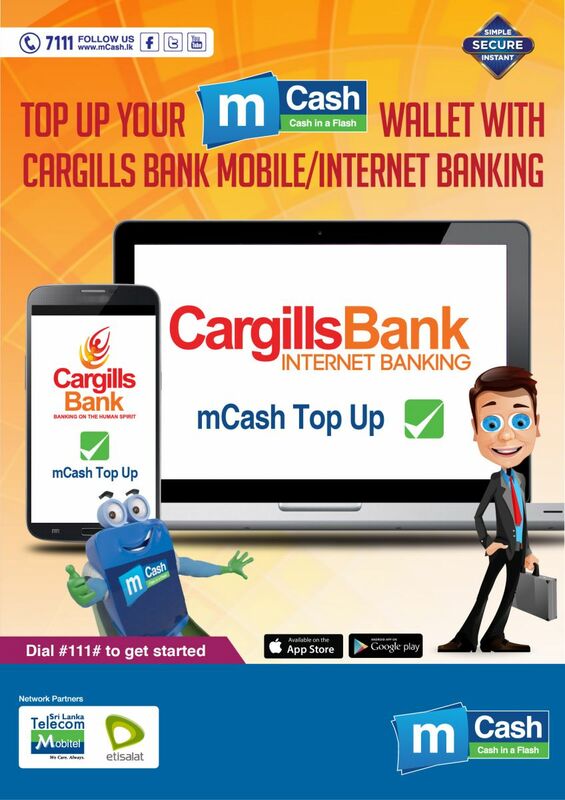 What are the banks available with this just pay service to top up mCash wallet? Do I have to register for mCash before using this service? Yes. 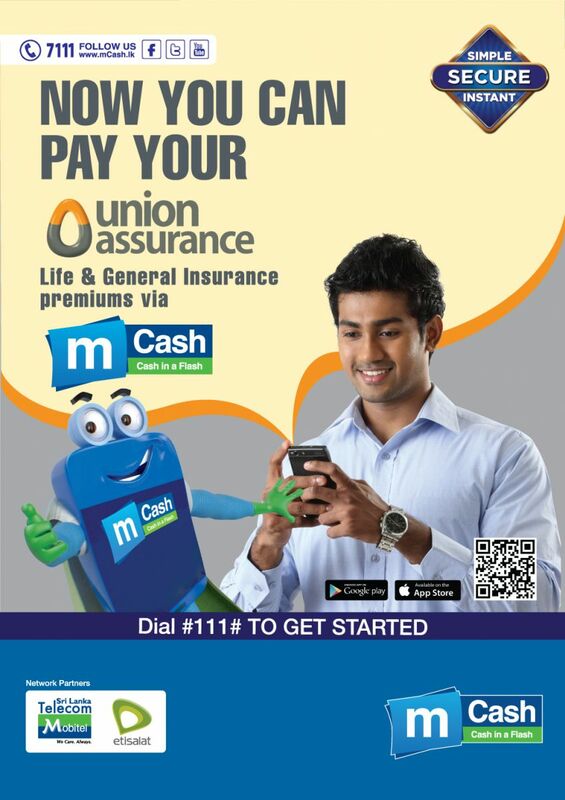 You need to dial #111# and successfully register for the mCash service. 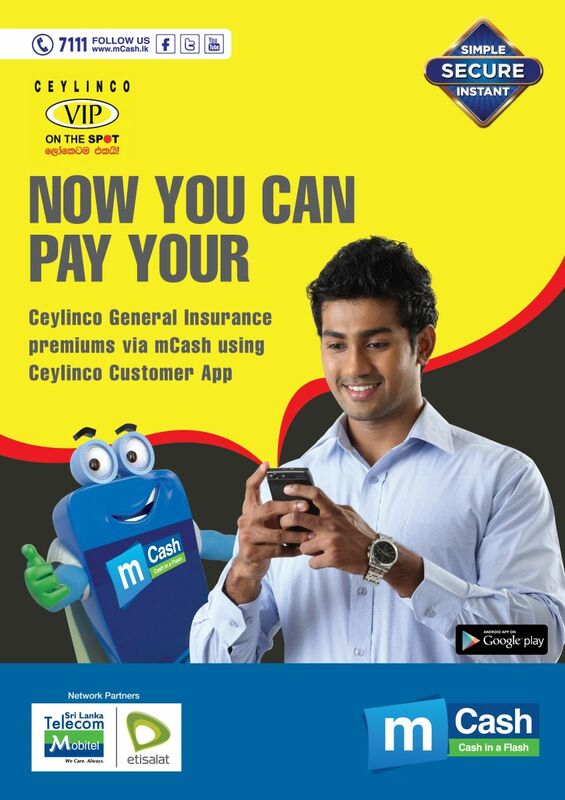 Then download the mCash app from the Android Play Store in order to use this service. What are the Mobile Operating Services available for this wallet top up service? What is the minimum and maximum amount I can top up via this service? How Do I add my Bank account to Top Up my wallet via Just Pay? After entering bank details, your respective bank account will be charged a random amount. This amount you will be able to find out by calling the bank, SMS banking or online banking. This charged amount will be refunded back to your bank account within one working day. How Do I Top Up my mCash Wallet via Just Pay service? How Long does it take to Top up my mCash wallet via this service? Are there any additional fees/charges for this service? Can I have two Bank account additions in the same device? How many times can I try the random amount? You can try only 3 erroneous entering. After that you need to add the bank account again and go for a new random amount charging. Previous debited random amount will be credited to your bank account within one working day. How Do I remove my added bank account? If an erroneous transaction happens, where to call & Inform? What are the Transactions that could be done via mCashQR? What needs to be done before using the mCashQR? If you are using the mCash App makes sure the App is updated to the latest version from Google Play or Apple App Store. If you have not downloaded the mCash Mobile App you can download the latest mCash Mobile App from Google Play or Apple App Store. How to access mCashQR in the mCash App? What are the other options within mCashQR in the mCash App? Generate mCashQR Using this option, you can create a unique mCashQR by inputting a value eg. Rs 500 and then be used to receive cash from other users. My mCashQR and the mCashQR generated through Generate mCashQR could be saved directly and share via email, social media or any available sharing platform and even could be used for printing if needed. How to select the Transaction Type using the mCashQR? How to complete the transaction after selecting the transaction type? Once the above is typed you only need to confirm the transaction. If the transaction is successful, you will receive a successful pop up and simultaneously a SMS Confirmation. How to identify the mCashQR? What are additional charges for using mCashQR? 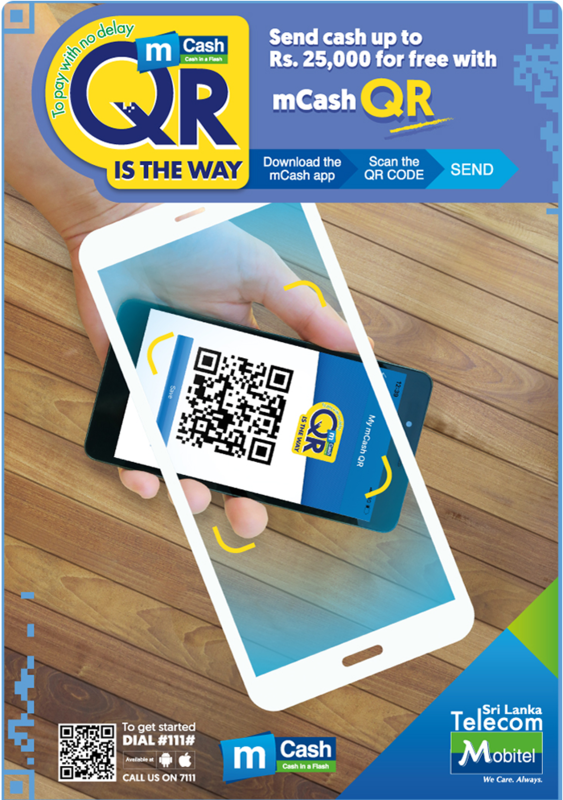 There are no additional charges for using mCashQR, however existing mCash Fees & Limits will be applicable for certain transactions. What would be the Transaction Fee and Limit to Send Cash (Money) via mCash or mCashQR? What would be the Transaction Fee and Limit to Withdraw mCash via mCashQR? Rs 20 Fee is charged for every Rs 1000 mCash Withdrawal which is the normal applicable fee for mCash Withdrawals at any location such as ATMs. What would be the Transaction Fee & Limit for Purchases? What are the charges for making Bill Payments via mCash? Where can the Customer Top Up mCash? What is the new service launched with Open University of Sri Lanka? 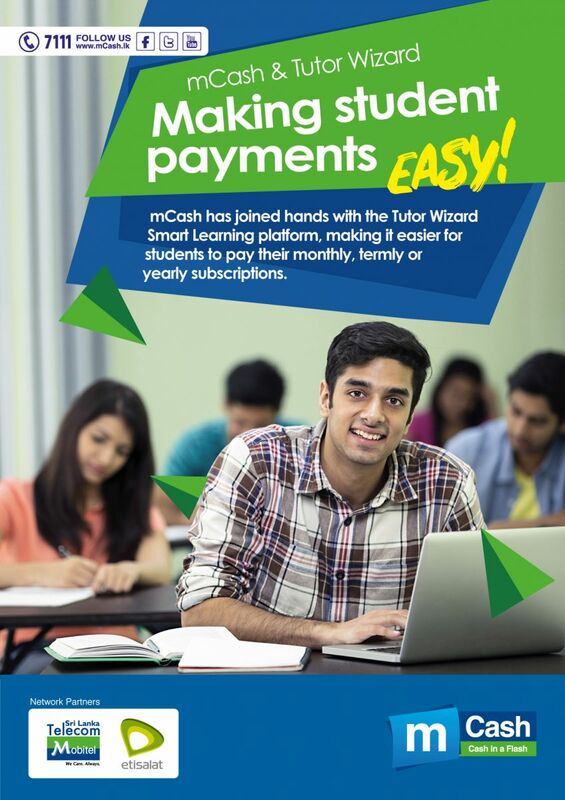 Open University of Sri Lanka is another value addition for education institute payments via mCash. 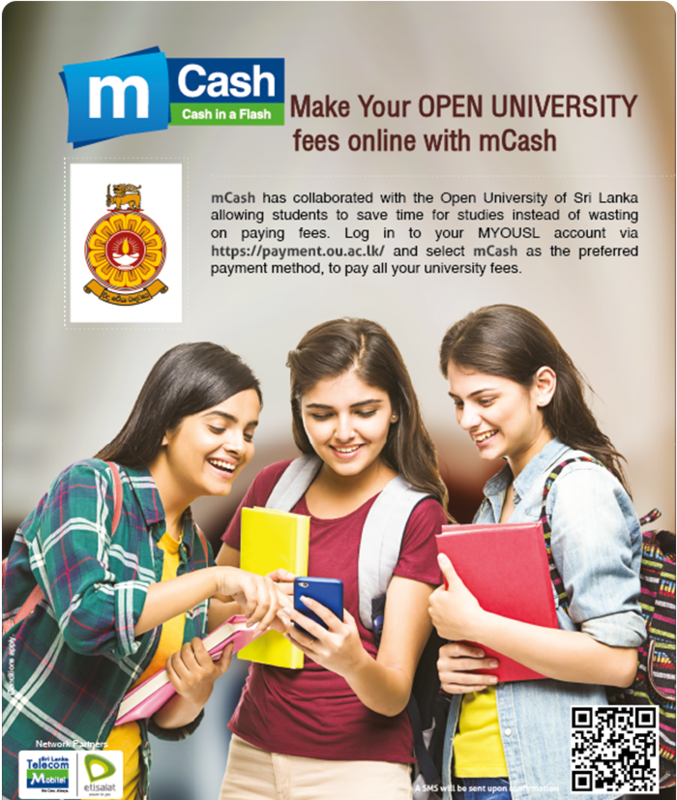 Open University of Sri Lanka students can pay their Student application fees and Student Tuition fees online via mCash. How can students pay their fees to Open University of Sri Lanka? Below are the steps need to follow for students to pay their Open University Online payments via mCash. Step 2: Select Apply Online. Step 3: Fill the Application details. Step 4: Select mCash as your payment method. Step 5: Enter mCash account number. Step 8: Submit the payment. A SMS will be sent upon confirmation. What is the maximum Amount that could be paid via mCash to Open University of Sri Lanka? There is no specific maximum amount that could be paid to Open University of Sri Lanka, however if you are a Basic mCash Account holder the maximum transaction value per day is Rs 10,000 and if you are a Enhanced mCash Account holder the maximum transaction value per day is Rs 25,000. What are extra charges for availing this service? Online Payments via mCash is absolutely free of cost. Only the amount you are required to pay Open University of Sri Lanka will be deducted from the mCash Account. How to know if the payment is successful? After each mCash Transaction a Confirmation SMS will be sent confirming the transaction, also on the Website transaction successful message will be displayed if the transaction is successful. 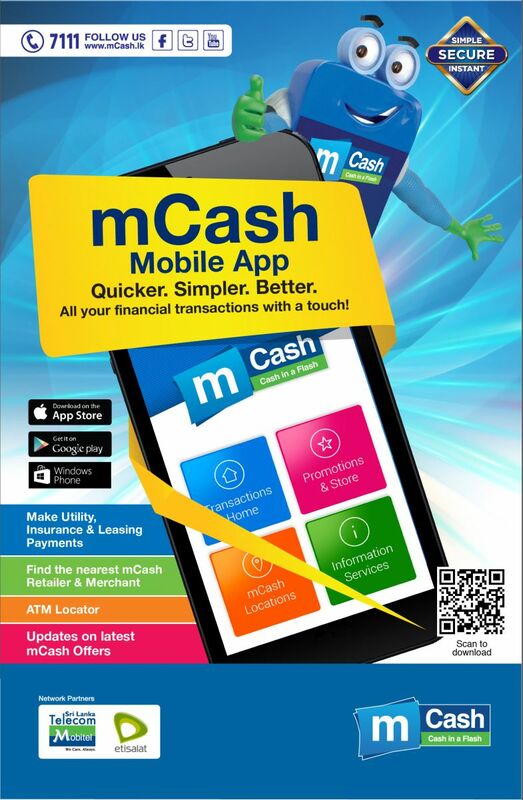 Customers could download the mCash Mobile App and Top Up mCash directly from the Bank Account. Customer should be Registered for mCash. 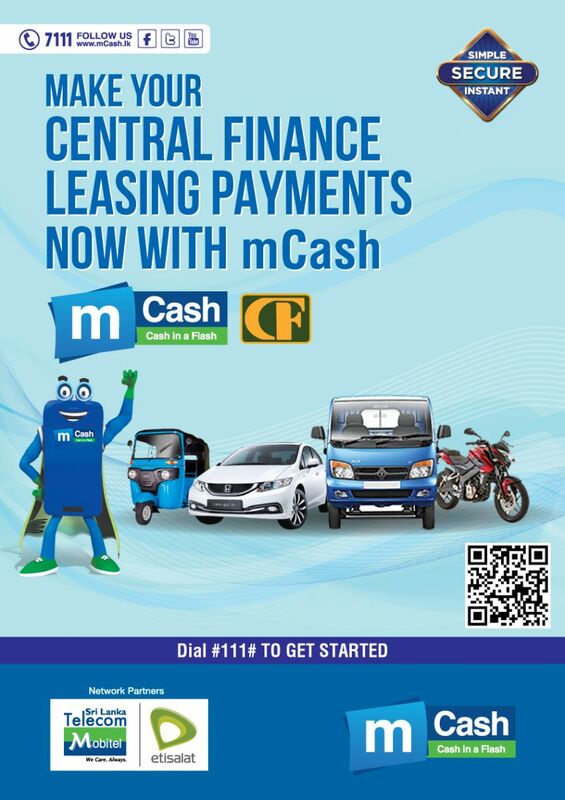 If not Customer should dial #111# to register for mCash free or charge. If the payment continues to fail despite above reasons call Open University Hotline Dr. (Miss) Indika Bulankulama (Actg. 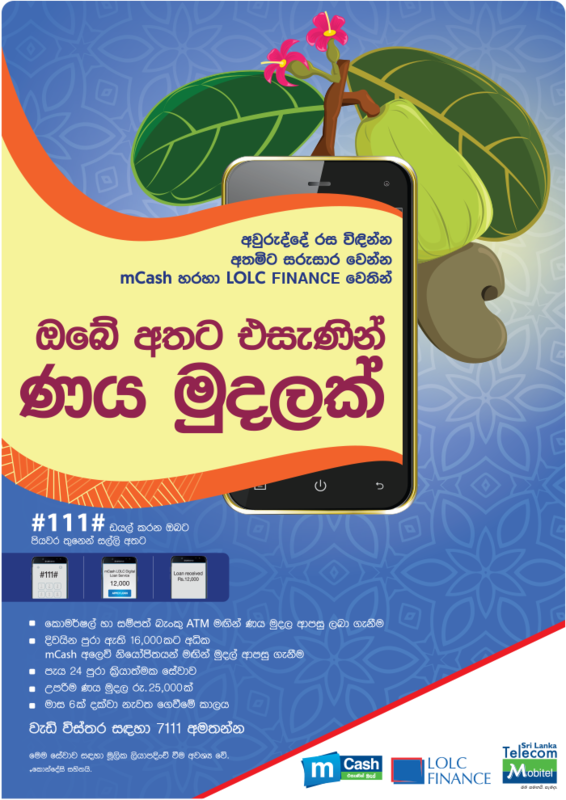 Director of Public Information Office) on 0112881256.
mCash Customers can top-up mCash wallets via Sampath Vishwa; Online and Mobile banking. Does the existing mCash Customer needs to register/do changes from mCash end? No, Customer does not have to do any change to mCash Account. Does the Customer need to register from Sampath Bank end? I’m a Sampath Bank Customer. How do I register for Sampath Vishwa? What is the path on Sampath Vishwa to perform a mCash In transaction? Can Customer, Cash In for any Mobitel Number? 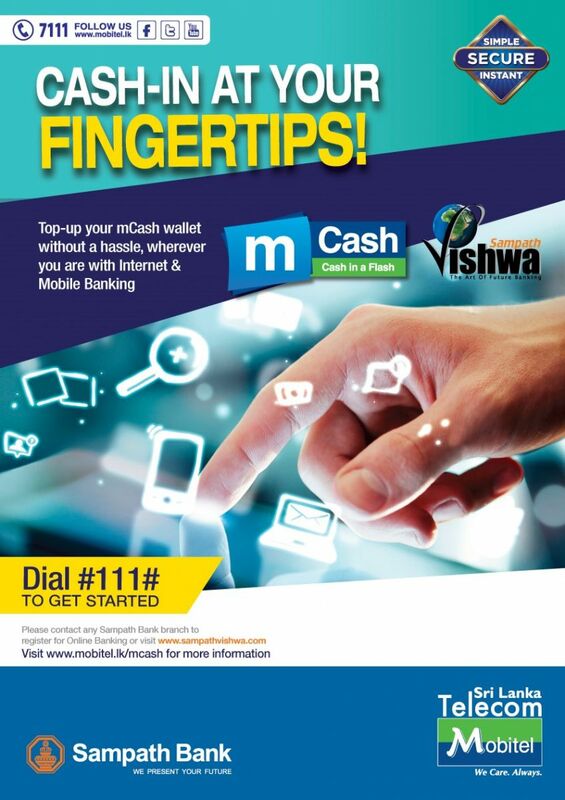 Yes, Customer can Cash In any mCash registered Mobitel Number. Do I have to pay extra service charges when performing a Cash In Transaction via Sampath Vishwa? No. This service is totally free for mCash customers. Does Sampath Vishwa give me a separate receipt/ref number for mCash In transactions or is it the usual confirmation SMS? Yes, You will received a SMS from mCash as well as reference number from Sampath Vishwa end. 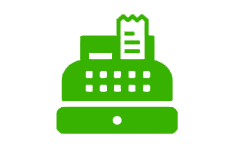 A Payment receipt can also be genereated via Sampath Vishwa. What Are the Cash In transaction limits when transferring Money through Sampath Bank Acc? One time Cash-In transaction limit is From Rs.1 to Rs. 5,000. How do I contact my Sampath Bank Branch & Their opening hours? Super branches are contactable from 8.00 am – 8.00 pm and Colombo Super branch from 7.00 am – 10.00 pm. If an erroneous transaction happens at when performing a Cash In , do I call Sampath Bank hotline or Mobitel hotline? mCash wallet limit is exceeded. E.g: If the wallet is Basic (limit is Rs.10,000) and customer has 8000 mCash Balance and he has Cash In 5,000 from Samapth Vishwa. Customer is not a mCash Registered customer. If I perform a mCash In transaction which exceed my mCash account limit, what is the process? Transaction will be reversed to the initialy debited account on the following working day. If I perform a mCash transaction which is to another customer’s account, what is the process? Customer needs to call Mobitel Hotline 7111 urgently and make a complaint. Mobitel will correct the transaction within 3 working days. Now Etisalat subscribers can Dial #111# and get registered for a mCash Account and instantly start performing mCash transactions. With this solution opened up, 6 million plus Mobitel subscribers will be able to send and share funds with 4 million plus Etisalat subscriber registered for mCash Accounts. 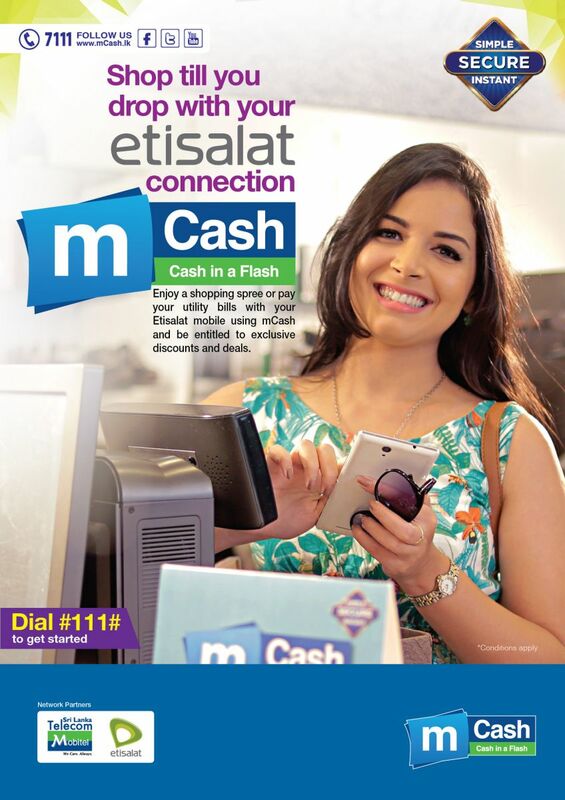 Does Etisalat Subscriber need to be a mCash Customer to perform a mCash transaction ? 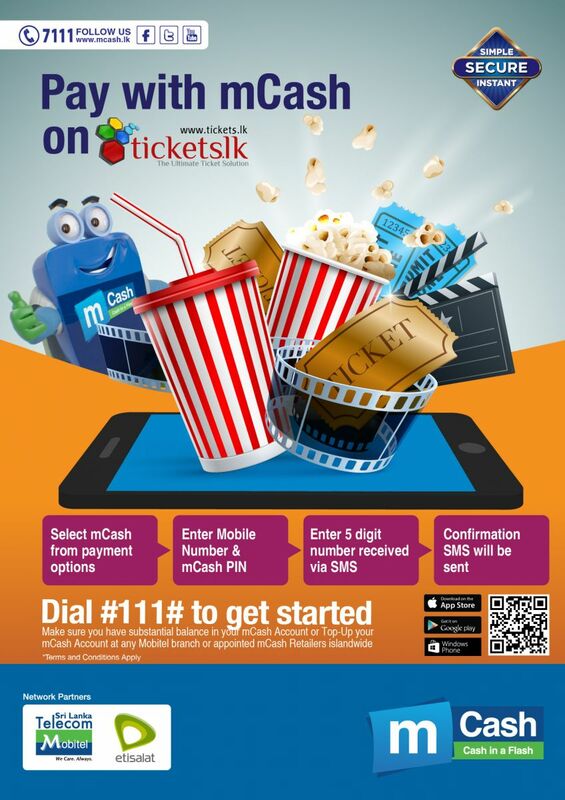 Yes, Etisalat Subscriber should Dial #111# and register for a mCash Account get the mCash services availed. What are the mCash services offered ? All mCash Transaction types are available for Etisalat Subcribers instantly when they registered for a mCash Account. What are the locations which can be used to perform Cash In and Cash Out transactions? Any location activated for mCash Cash In and Cash Out can be used by Etisalat Subscriber to perform these transactions for his/her mCash Account. Will I be charged extra for the services? Are the transaction limits the same? Yes, same transaction limits and daily limits will be applied. What is the hotline I should dial in case of a query/ issue? Etisalat customer registered for mCash Account should dial 7111 from his/her mobile phone to get in touch with the Etisalat Contact centre. 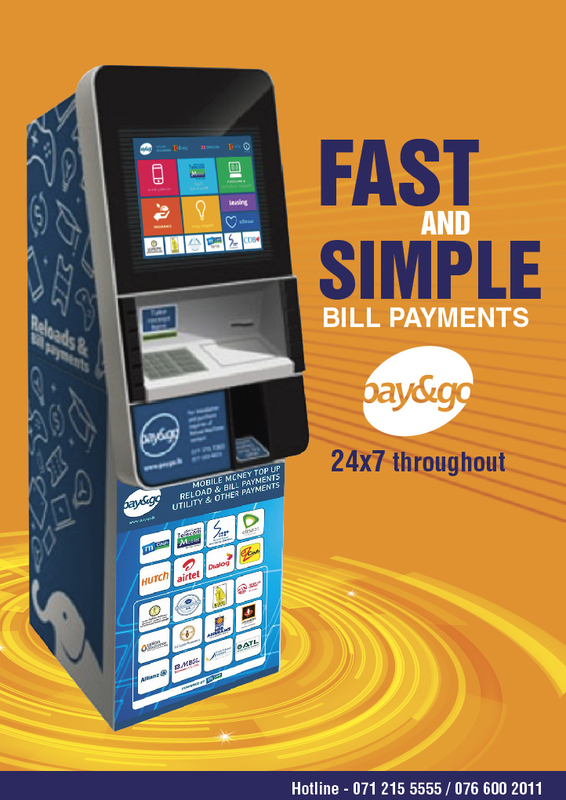 Customers can now conveniently make all their bill payments including Utility and Insurance payments at Pay & Go Kiosk machines located at over 200+ locations. Anti-Malaria Campaign No: 555/5 , 3rd Floor, Public Health Building, Narahenpita, Sri Lanka. Ceylon Petroleum Storage Terminals Kollonnawa, Wellampitiya. Ceylon Petroleum Storage Terminals Canteen Kollonnawa, Wellampitiya. Creative Marketing No.1, Parakrama Mawatha, Negombo Road, Peliyagoda. 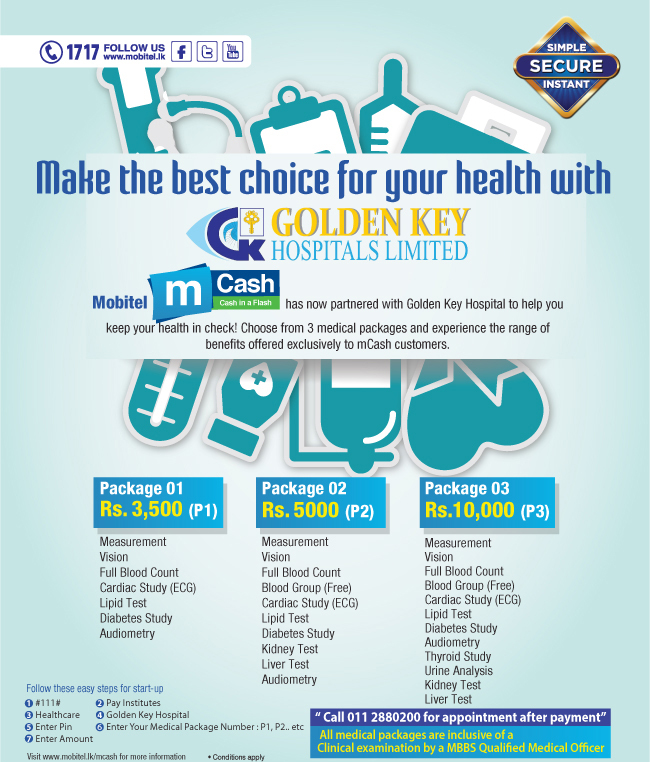 Golden Key Eye & ENT Hospital Limited No: 1175A, Cotta Road, Rajagiriya. Harcourts Bambalapitiya 88, Galle Road, Colombo 04. Harcourts Battaramulla 150, Main Street, Battaramulla. Harcourts Dehiwala 14, Station road, Dehiwala. Harcourts Grandpass 413, Grandpass Road, Colombo 14. Harcourts Hill Street 91, Hill Street, Dehiwala. Harcourts Punchi Borella 148,E.W.Perera Mw, Punchi Borella. Harcourts Rajagiriya 586, Nawala Road, Rajagiriya. Harcourts Wardplace 16A, Ward Place, Colombo 07. Mahawelli Authority of Sri Lanka 500,T.B. Jaya Mawatha, Colombo 10. Mobitel WTC Level 3, East Block, WTC, Echelon Square, Colombo 01. 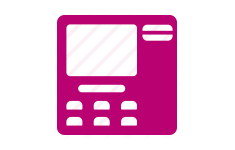 Pasilta Graphics (Private) Limited No: 26, Old Kesbawa Road, Gangodawila, Nugegoda. Quantum Clothing Lanka (Pvt) Ltd Millewa, Moragahahena, Horana. Road Development Authority (RDA) No: 216, Denzil Kobbekaduwa Mawatha,Koswatta, Battaramulla. What is the new service introduced? 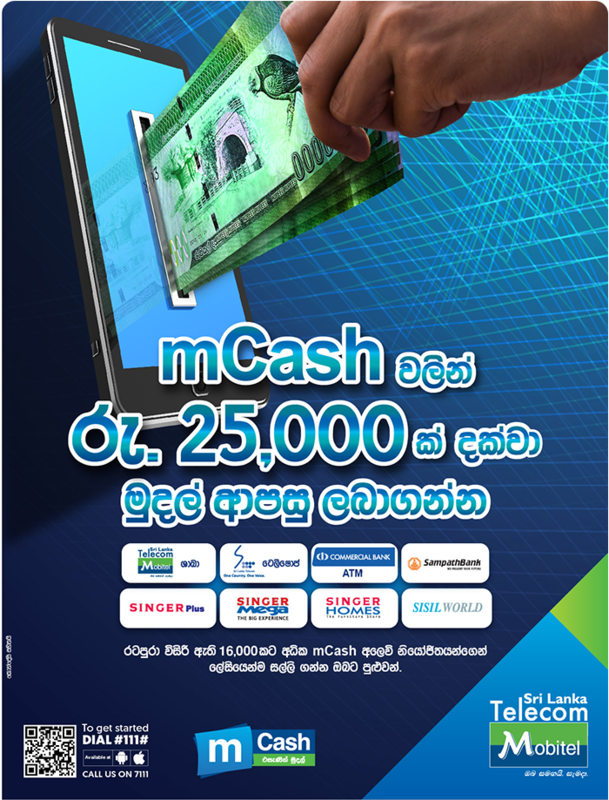 Should mCash Customer be a Sampath Customer to Withdraw mCash? No. The Customer to avail this service should not necessarily be a Sampath Bank Customer. The OTP sent by Sampath Bank via SMS is valid for 14 days. How many times can the OTP be used? OTP can only be used for one successful transaction upon which the OTP will be expired. Will the mCash Account be deducted at the time of requesting an OTP? Yes. mCash Account will deducted with the requested Withdrawal Amount and applicable charges at the time of requesting the OTP. What would happen if the OTP is received and Customer doesn’t not Withdraw mCash for 14 days? Can the Customer cancel the Transaction before 14 days and request for a refund? How many times can the Customer Enter the OTP Incorrectly at the ATM? Customer can only Enter the PIN incorrectly for 3 times upon which the Transaction will be suspended. How else could the Transaction be suspended? What should be done after the Transaction is suspended? What to do if the ATM is constantly rejecting the NIC even if the Customer NIC is entered correctly? Customer should #132# and check if the NIC in the Mobitel System is correct. If the NIC displayed is incorrect the Customer should visit the nearest Mobitel Branch and request to change the NIC. Customer should visit with the original NIC to make the request. What are Withdrawal Limits for Sampath Bank ATMs? Existing mCash Transaction & Withdrawal Limits are applicable. For a Basic Account Customer the maximum Transaction Limit would be Rs 10,000 & for an Enhanced Account Customer the maximum Transaction Limit would be Rs 25,000. What should be done if the Customer need to Withdraw mCash more than the Per Transaction Limit of Rs 5000? 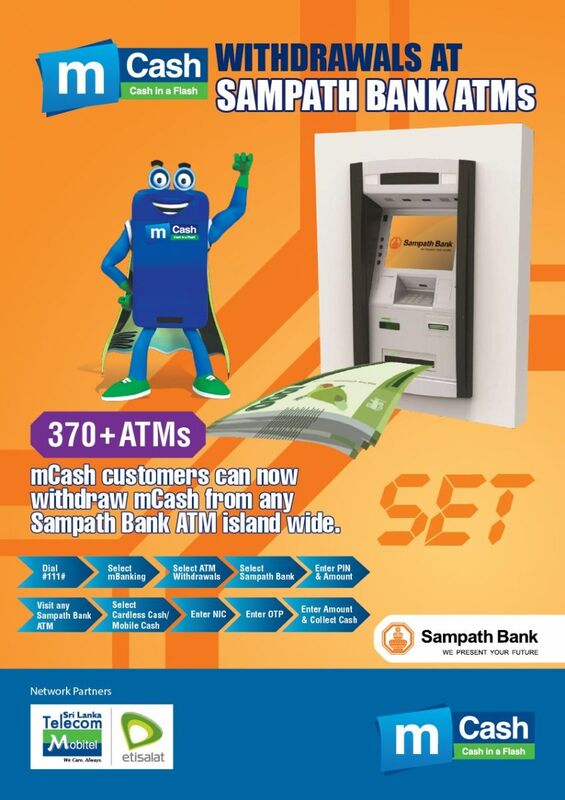 What are the Charges Applicable for mCash Withdrawals at Sampath Bank ATMs? What are Commercial Bank ATMs that mCash Customers can use to Withdraw cash? 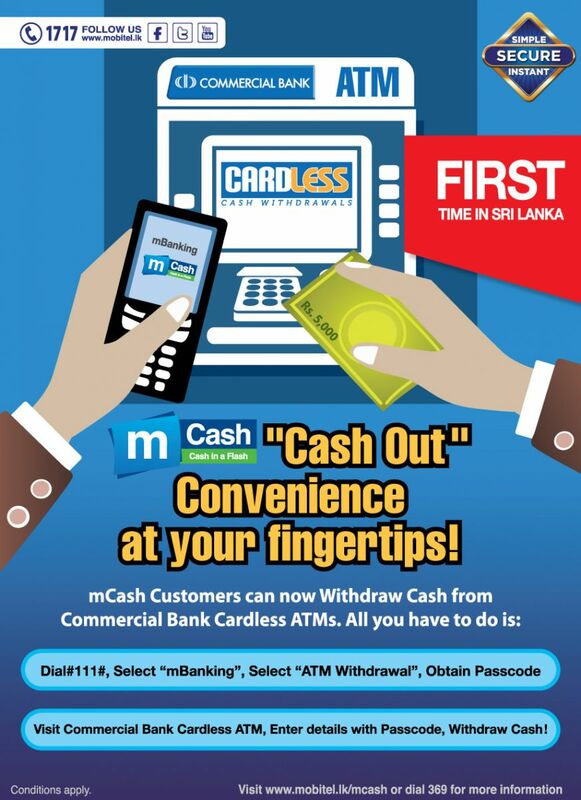 Following CardLess ATMs of Commercial Bank will be available for mCash Cash-Out service. All other Commercial Bank ATMs will be activated for this service very soon. What is the new service about? Does the mCash Customer need to have a Commercial Bank Account to use the facility? No.Only required to have a mCash Account. Is there a card involved in the process of Withdrawal at ATM? No. this is a Card-less process. However you are required to have the Mobile Phone with the mCash Account to receive the PassCode and other confirmation SMSs. Is there a limit that mCash Customer can withdraw money from the mCash Account via ATMs? Yes. Current mCash Cash Out limits will apply. What does the customer need to do in order to perform a Withdrawal @ Commercial Bank CardLess ATMs? What is this 5 Digit PassCode? mCash Customer is sent a five digit authorization number via SMS when “ATM Withdrawal” is requested as mentioned above. This 5 Digit Pass Code is required to be entered on the CardLess ATM to obtain cash. This number will be valid only for 30 minutes for security purposes. What will happen if 5 Digit Pass Code is expired? You need to request for another pass code after 30 minutes by following the steps mentioned above. This is due to the fact that first Pass Code will be expired after 30 minutes. What will happen if thePassCode SMS is accidentally deleted which ? You can log to mCash Account and request for the PassCode again. If your request comes within 30 minutes, then same PassCode will be sent via SMS. If 30 minutes expired, then you will receive a new PassCode. How would mCash Customer know that ATM withdrawal is successful/ rejected? There will be number of messages displayed on the Cardless ATM machine on the status of the transaction. Further mCash will also send successful / rejected transaction status via SMS. This SMS will include your account balance after the ATM transaction. Is there a service charge when performing a mCash cash-out through a Commercial Bank Cardless ATM? Current mCash Cash Out Charges will apply. Is there an Additional Fee charged by the Bank ATM? No. There are no additional fees charged to mCash Customers by the ATM or the Bank. Only charges applicable will be the mCash Cash Out fees as described above. Can a customer perform a mCash withdrawal if the customer does not have the mobile phone with him/her? No. 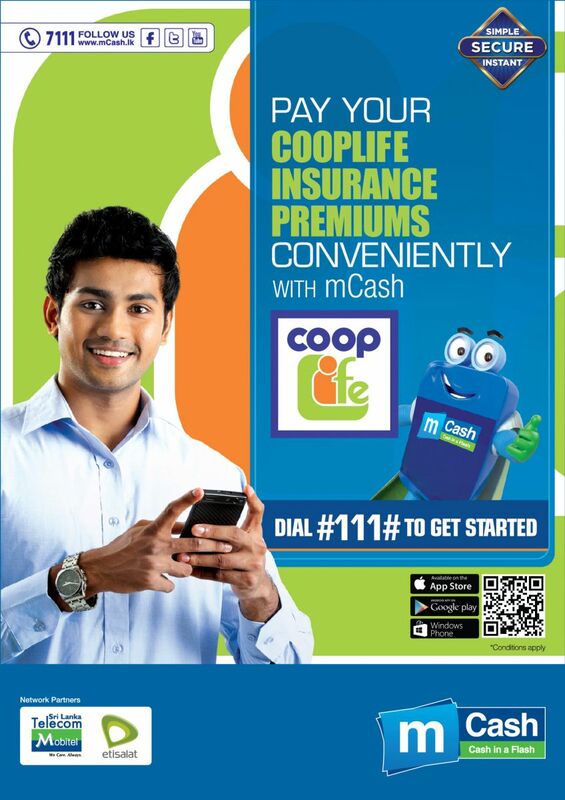 mCash Customer is required to carry the Mobile Phone to receive the 5 Digit Pass Code. Therefore Mobile Phone is required to complete the Withdrawal at Bank ATM. 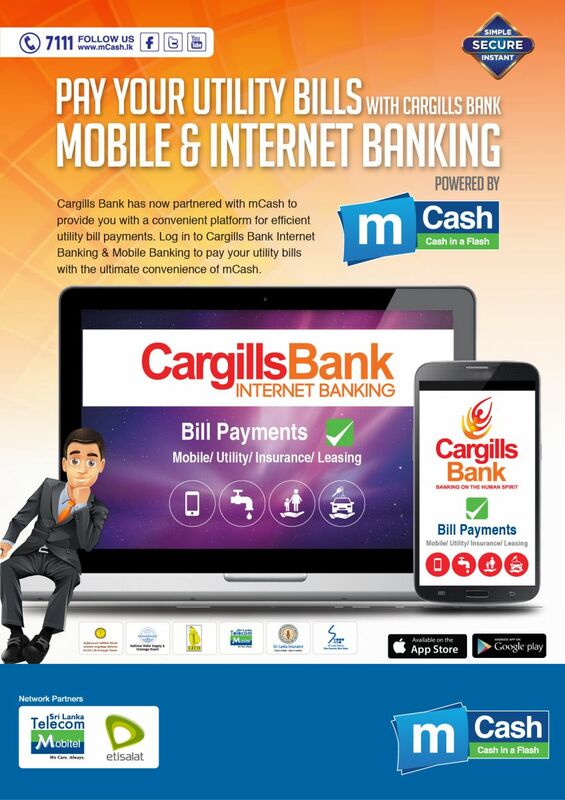 What is the benefit for mCash customers by using this service? mCash Customer can visit ATMs 24 X 7 for Cash Out transactions adding great deal of convenience. Under what situations would one require to withdraw money from the mobile wallet? Please ensure that your PIN is kept confidential at all times. You could register for a Basic mCash Account by dialing #111# and upon registration you’ll be entitled to an account limit of Rs. 10,000. If you wish to, you may upgrade your account to an Enhanced Account with an account limit of Rs. 25,000. Please visit your nearest Mobitel Service Point or download the application form and submit it to the nearest Mobitel Service Point to upgrade to an Enhanced Account. 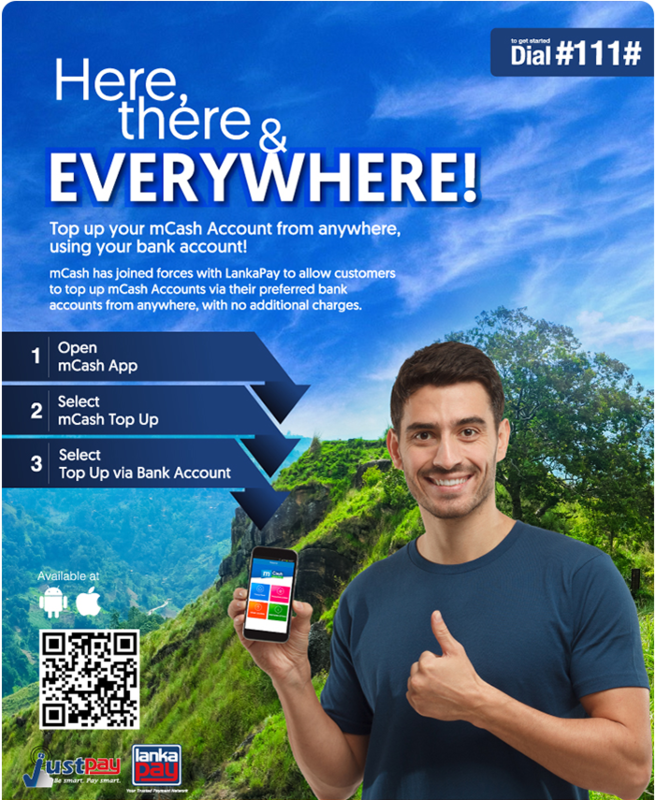 mCash is an unique service which enables you to perform a wide array of financial transactions using your Mobitel phone anytime, anywhere. 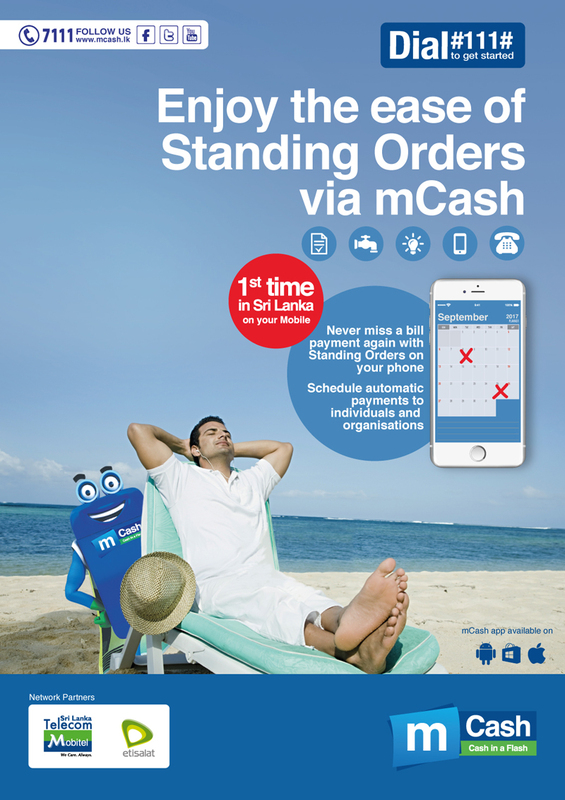 mCash is both easy to use and approved by the Central Bank of Sri Lanka, which ensures safety of your transactions. How do I register for mCash? 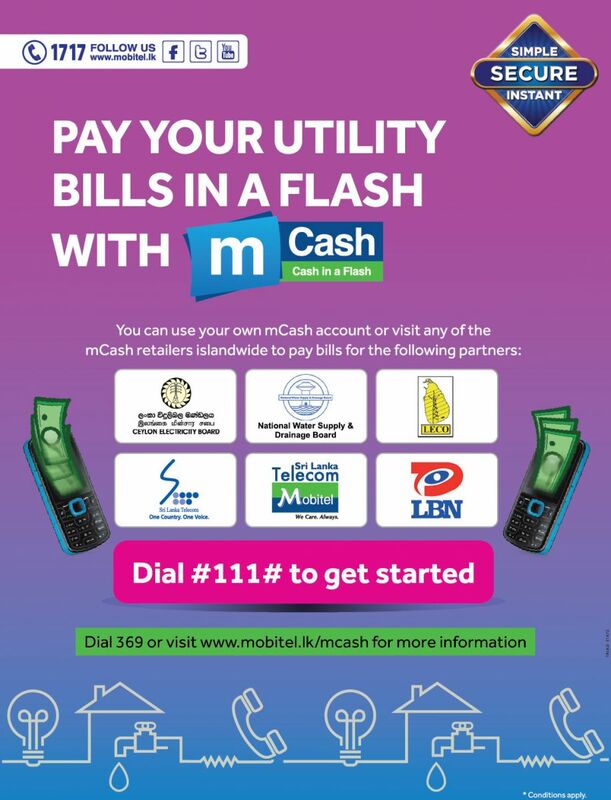 Dial #111# on your Mobitel phone or visit any Mobitel Customer Service Point to register for mCash. Is there a limit to my mCash account? Yes. You have an upper limit of Rs. 10,000 but if you wish to you could enhance your limit. How can I enhance my mCash account limit? You can upgrade to an Enhanced Account with an account limit of Rs. 25,000 at any Mobitel Branch. Do I need to have a bank account to use mCash? No, you don’t need to have a bank account. Can I use mCash on my existing phone number? Yes. You can activate the service on your existing phone number. What are the available features of mCash? 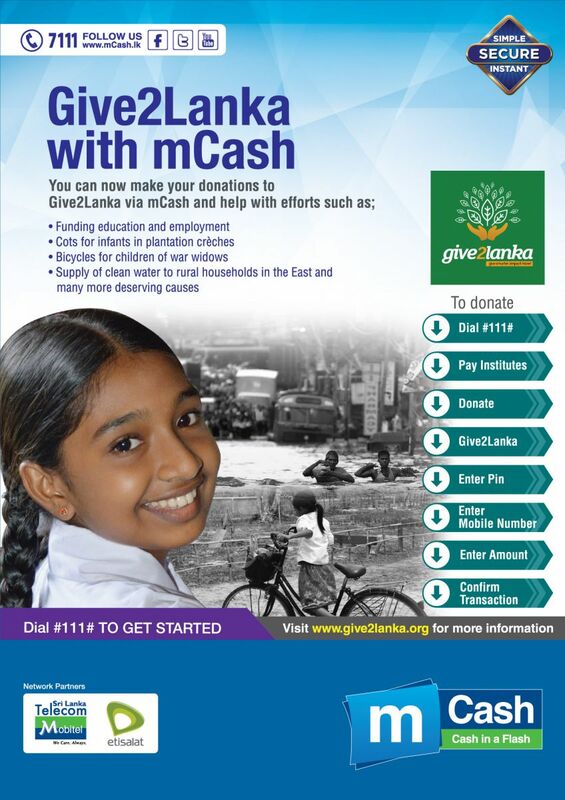 Can I use my mCash account outside of Sri Lanka? Can I transfer money from my bank account to my mCash account? Will I get charged a registration fee? No. Registration for mCash is free of charge. How do I get a statement of my transactions? Option 02: Obtain a Detailed Statement from any Mobitel branch. How will I know whether my transaction is successful? You will receive a confirmation SMS after every transaction. What if I don’t receive a confirmation SMS after a transaction? The transaction is complete only when both parties involved receive an SMS confirming the transaction hence if you don’t receive an SMS please call on our hotline 1717. Do I get charged for receiving an SMS? All the SMS’s that you receive are free of charge. Is there a daily fee for using mCash? There is no daily fee for using the service. Do I have to maintain a minimum balance in my mCash account? Do I need to pay any service charges for this service? No, but transaction fees may apply depending on the type of transaction – Please refer below Transaction Fees. 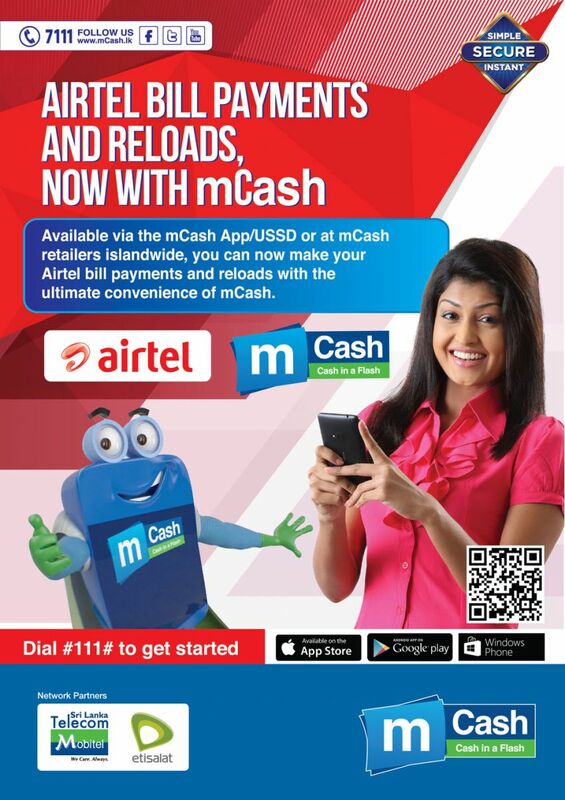 Do all mobiles support this mCash service? Yes, you could use the service on any mobile phone. If I misplace my PIN do I have a way to reset it? Yes, you can reset your PIN by visiting a Mobitel outlet. What happens to my mCash account if I lose my Mobile phone? There won’t be an issue as your account is secured with a PIN, but if you wish to you can go to a Mobitel outlet and make a request to disconnect your mCash account until further notice. Yes, the service follows guidelines of the Central Bank of Sri Lanka. Will I be charged for receiving money to my mCash account? No. Receiving money transfers into your account is FREE. No, checking account balance is absolutely FREE. I have sufficient funds in my account but why can’t I perform a transaction? There is a daily transaction limit applicable and once you exceed the amount you will not be able to carry out transactions until the next day. Where can I top-up my mCash account? There are more than 10,000 mCash points across the country. Visit any Mobitel branch or retail outlets to top-up your account. 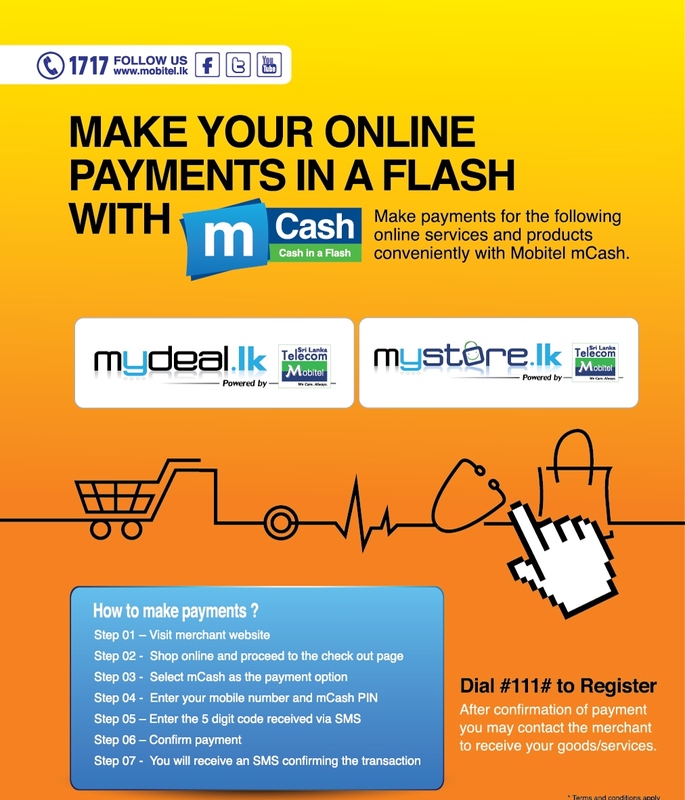 Please refer mobitel.lk/mCash for full list of Retailers. Please refer here for full list of Retailers. 29. Can I pay for goods and services purchased with mCash? 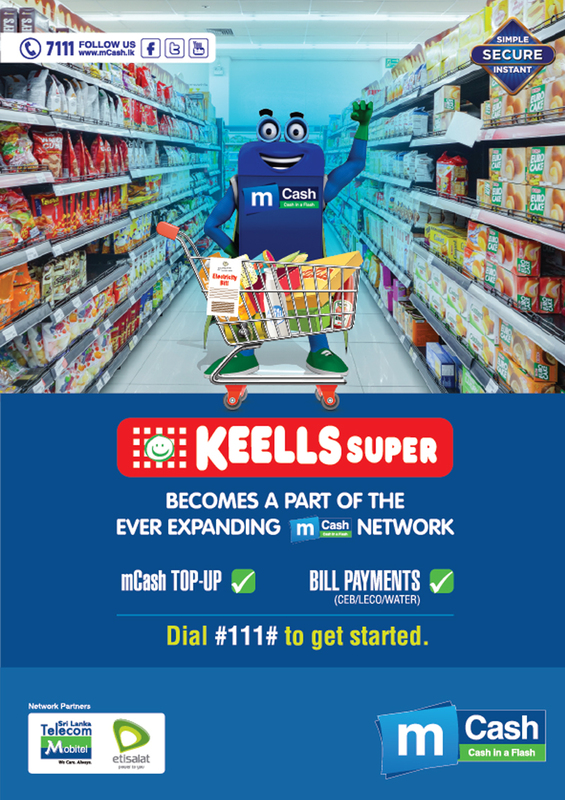 Yes, you can pay with mCash at selected Merchants. mCash sign would be prominently displayed at all our merchant partners. 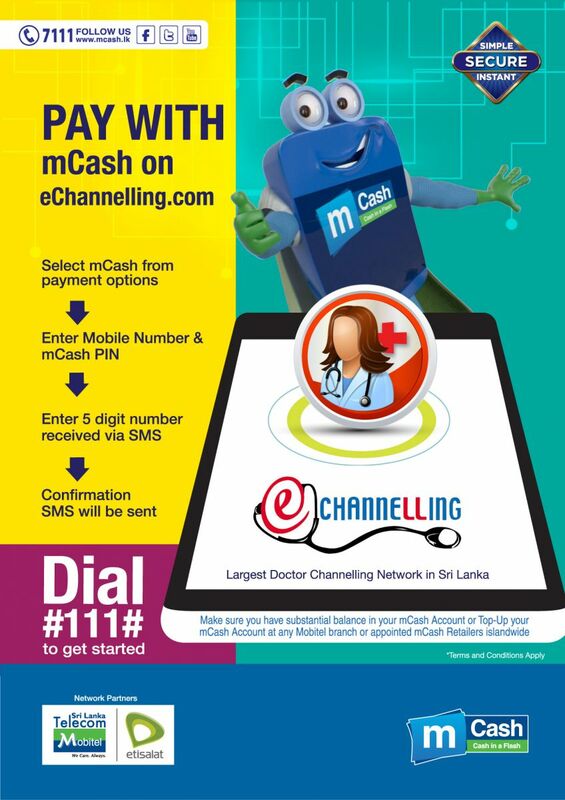 Please refer mobitel.lk/mCash for full list of Merchants. 30.How can a Merchant get registered for mCash? Please call for 1717 for details on how to sign up as a mCash Merchant. 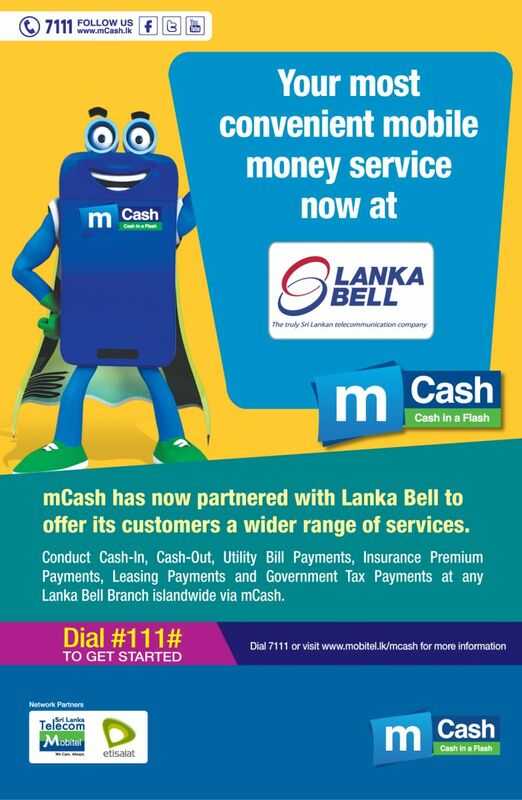 Customers can perform all mCash transactions, Utility, Leasing & Insurance payments at Lanka Bell branches island wide. Does the Customer need to also be a Lanka Bell customer to perform an mCash transaction at Lanka Bell? No, Customer does not has to be a Lanka Bell customer. 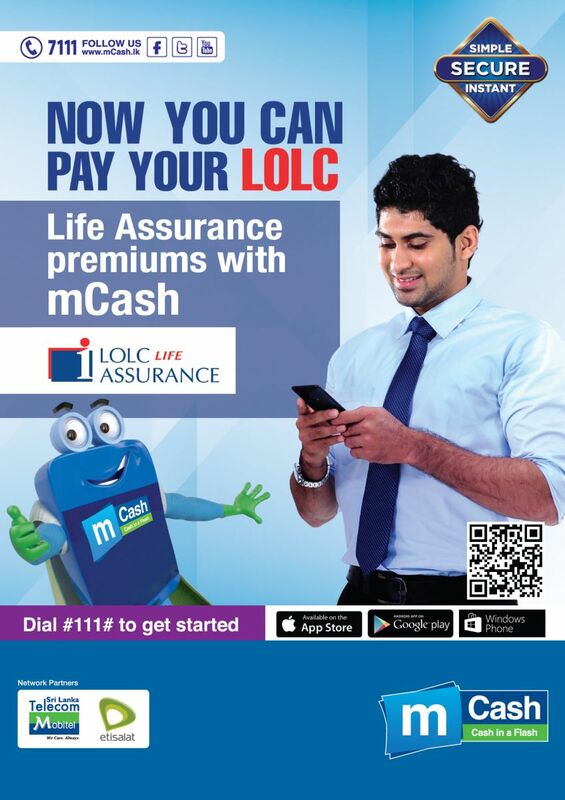 What are the mCash services offered at Lanka Bell? 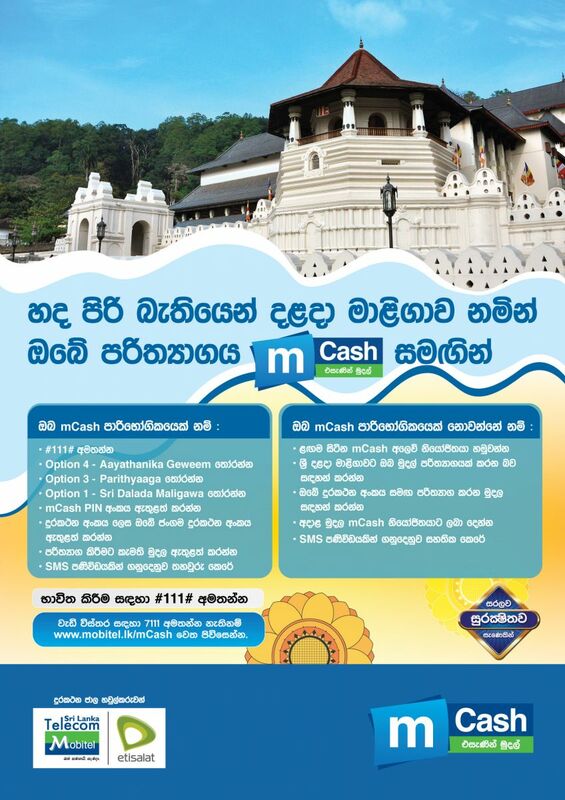 Where are the Lanka Bell branches located where I can perform mCash transactions? Do I have to pay extra service charges when performing transactions at Lanka Bell branches? Does Lanka Bell give me a separate receipt for mCash transactions or is it the usual confirmation SMS? 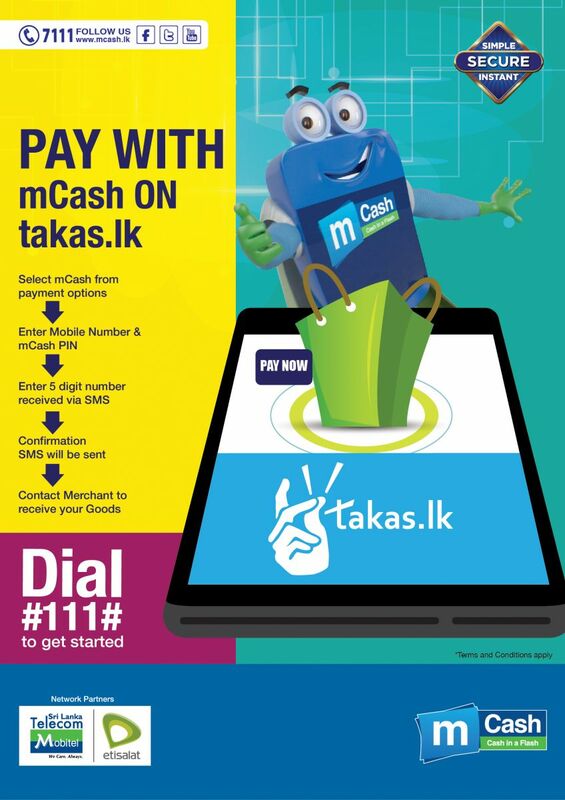 Are the transaction limits the same at Lanka Bell for mCash services? I am a Lanka Bell customer. Can I perform Lanka Bell transactions via mCash? What are the times that these Lanka Bell branches are opened & closed? Are the Lanka Bell branches open on weekends / Poya days / Public Holidays? Lanka Bell branches are open half day on Saturday. Sunday and other holidays, the branches will be closed. If an erroneous transaction happens at Lanka Bell, do I call Lanka Bell hotline or Mobitel hotline? mCash has now partnered with Abans to make your life simple and more convenient. Engage in Cash-In, make Utility Bill, Insurance Premium and Leasing Payments at any Abans Showroom island wide. 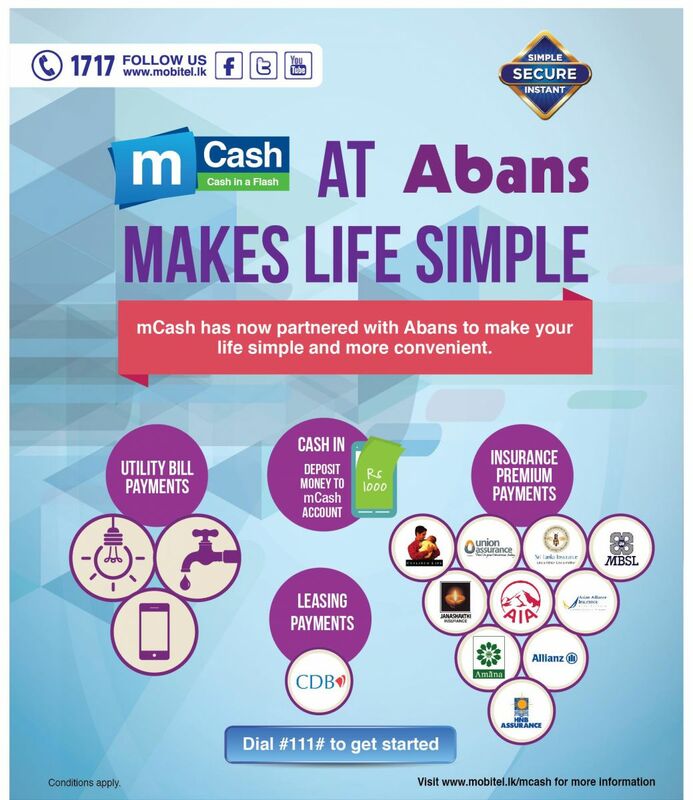 Customers can perform all mCash transactions, Utility, Leasing & Insurance payments at Abans showrooms island wide. Does the Customer need to also be a Abans customer to perform an mCash transaction at Abans? No, Customer does not has to be a Abans customer. What are the mCash services offered at Abans? Where are the Abans showrooms located where I can perform mCash transactions? Do I have to pay extra service charges when performing transactions at Abans Showrooms? Does Abans give me a separate receipt for mCash transactions or is it the usual confirmation SMS? Are the transaction limits the same at Abans for mCash services? I am a Abans customer. Can I perform Abans transactions via mCash? What are the times that these Abans showrooms are opened & closed? Are the Abans showrooms open on weekends / Poya days / Public Holidays? If an erroneous transaction happens at Abans, do I call Abans hotline or Mobitel hotline? Are new mCash Customers allowed to access this Service? Yes, any mCash Customer is allowed to access this service. I. Check Eligibility: This is the instance where the customer is reviewed on his eligibility. II. Apply Loan: This is the instance where the customer will be applying for the loan based on the eligibility confirmation. How is the Customer eligible amount calculated? Each Customer is given a credit score based on Mobitel product usage and payments. Together with this credit score, LOLC Finance will apply another set of scoring values which will define the eligible Loan Values. LOLC Finance is the party that decides on the maximum Loan Value for each Customer. Are guarantors required to get the loan? No guarantors are required for this loan service. One Month: No interest rate but a 5% service and Rs 100 collection fee will be charged. Six Month: 5% onetime service fee, 3% and Rs 100 collection fee will be charged per month. What are the deductions when getting the Loan Amount to the mCash Account? Prior deductions are only applicable for the One Month Loan. What happens if the customer does not settle the loan within the period? Can the Monthly Loan Installment be settled before the due date of the month? No, Customer cannot settle the monthly loan installment before the due date of the month. However, Customer can settle the Overdue amount anytime by selecting the Pay My Loan Option. If the Customer mCash Account has a balance in the mCash Account will the Loan Amount get disbursed? If the Loan Amount and the existing mCash balance exceeds the maximum Account Limit then the Loan amount will not be disbursed. Therefore, the Customer will have to utilize the existing mCash balance to receive the Loan Amount.